Season April - November: Discover Berlin from all perspectives. Classical 3 - hour city sightseeing tour on land from the starting point of your choice, depending on group size in a motor coach, panoramic minibus or van; including exits, photo stops and small walks with endpoint at the ship landing stage for the subsequent river cruise. 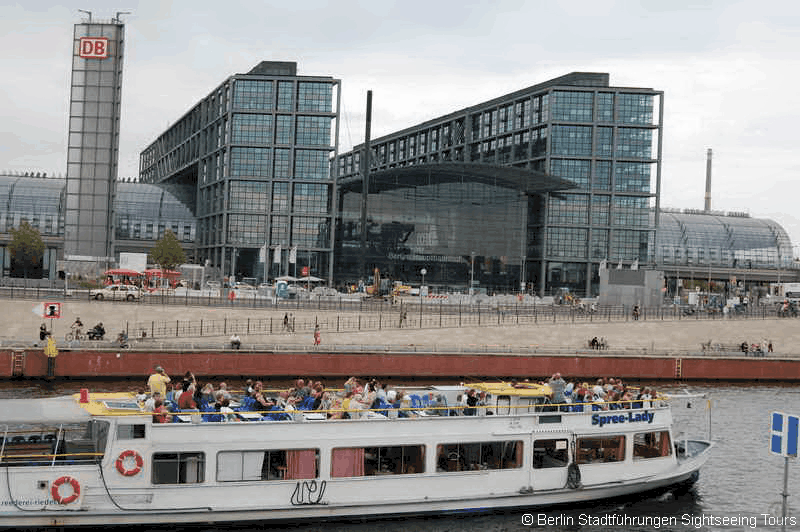 Followed by a 1,5 -hour Berlin city core boat trip on the river Spree or a 3,5-hour Berlin cruise Bridges of Berlin Tour on Landwehr Canal and river Spree. Berlin City Tour e.g. : 8:00am - 11:00am or 10:00am - 1:00pm or 12:00noon – 3:00pm or 2:00pm - 5:00pm. or 3:30pm - 5:00pm or 5:30 - 7:00pm. Berlin City Tour: i.e. from 11:00am - 2:00pm or 5:30pm - 6:30pm. from 2:30pm – approx. 5:40pm or 7:00pm - 10:15pm. Berlin boat cruise on the river Spree. As in no other city in Europe, you can look from the water directly into the heart of the city. A large part of the architecture has been oriented towards the water; the banks of the river Spree are not lined with streets. In particular, this aspect makes the attraction of a boat trip in Berlin forcibly mandatory to get to know the city completely. Book the combination city tour and river cruise with a Spree cruise boat trip or the large Bridges of Berlin Tour. Coach with 30 or 50 seats. Mini Bus with 16 or 19 seats. Minivan with up to 5 or 7 seats + tour guide. City Core Cruise boat trip on the river Spree. Bridges of Berlin Tour on Landwehr Canal & river Spree. From / to Pier Märkisches Ufer. Season April - November. Special prices for school groups. Combination Berlin city tour and river cruise. It combines a bus or van tour with stops at sights, short walks and a Berlin boat cruise. This tour will show you everything Berlin has to offer without leaving you on your own to get lost or miss attractions. Our tour guides hop off with our guests. Your tour guide will hop off the bus with you at selected sights, showing you each Berlin attraction in detail.